Using the machine provides the same level of comfort as the larger ride-on scrubber dryer: The intuitive display with all major functions and the battery status makes it easy to control, together with the large buttons, and the clear view of the water/detergent level indicator. Also adding to the user comfort is the USB-port for fast charging of cell phones and tablets. The big steering wheel ensures that the AS530R is easy to maneuver with a minimum of training, and when driving, comfort is added by the automatic braking system engaged when the pedal is released. Another benefit is that the squeegee can be placed on the hanger behind the main body when the machine is driving through narrow passages. 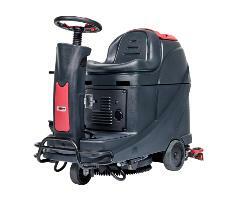 All handling can easily be carried out when it is time to empty, refill or clean the tanks of the scrubber dryer. Service and maintenance are also convenient, i.e. with direct access to dismounting or mounting of the driving motor if needed. All in all, the AS530R is easy to use and offers fast, effective cleaning at a very competitive price.